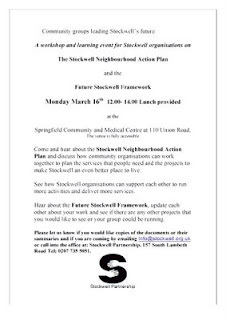 Come and hear about the Stockwell Neighbourhood Action Plan and discuss how community organisations can work together to plan the services that people need and the projects to make Stockwell an even better place to live. See how Stockwell organisations can support each other to run more activities and deliver more services. Hear about the Future Stockwell Framework, update each other about your work and see if there are any other projects that you would like to see or your group could be running. Please let themknow if you would like copies of the documents or their summaries and if you are coming by emailing info@stockwell.org.uk or call into the office at: Stockwell Partnership, 157 South Lambeth Road Tel; 0207 735 5051.